Corvettes are small, lightweight, powerful warships. The name comes from the French "corvette" and Latin "corbita", transport ship. Archetype: (Latin) "Basket", "corbis". Many large and small States such as Russia, Italy, Spain, Poland, South Africa, Israel, Brazil, Turkey and Indonesia take different types of missile Corvette. Also Sweden's Visby class convinced thanks to groundbreaking stealth technology. Germany has with the K 130 one of the most modern ship types. In case of conflict against the Warsaw Pact, the German Navy had to wage a war of multiple skirmishes, extremely brief raids which explains that the German must provide of a large force of missile ships, nearly 40 ships that have served in the German Navy. These ships were ideally suited when it was necessary to attack Polish, East German and Soviet navies in the Baltic. Bhen it is necessary to protect the commercial traffic in the Strait of Gibraltar (operation Active Endeavour), prevent Hizbollah from shipping weapons, or hunt down pirates and terrorists off the coast of Yemen and Djibouti, these patrol boats are totally outdated because they are unable to meet the new challenges post 9 / 11: the projection of power and special operations support. The German Navy decided to replace its missile patrol Type 143B Albatros, which entered into service in the 1970s, with a series of corvettes multi-mission, much larger (1500 tonnes compared with 300 tonnes for patrollers) which was to undertake the following tasks : protection of maritime routes against terrorism and piracy, defence of territorial waters, monitoring and recognition in the littoral environment, combat on the high seas, support operations ashore in particular special forces. These specifications and this research resulted in the Type 130 series of multi-mission corvettes. 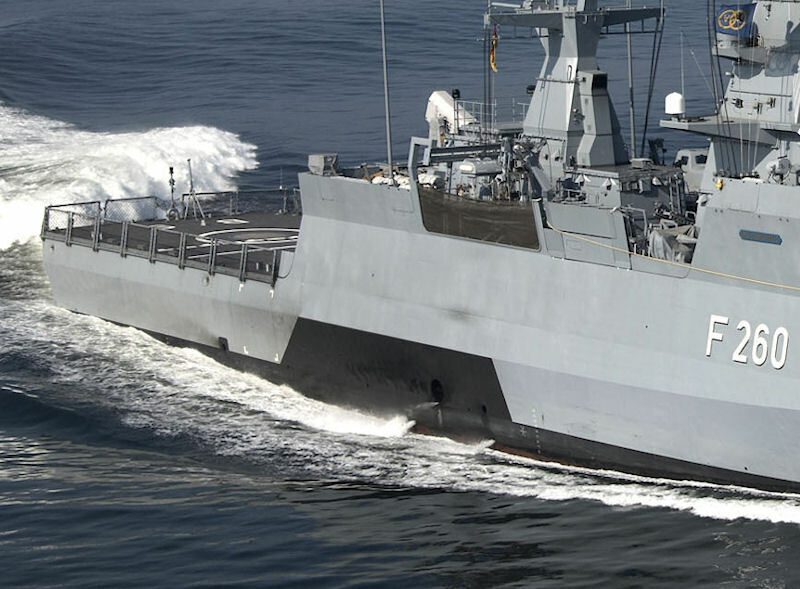 The specification of the new Class 130 generation of corvettes for the German Navy, defined on a competitive basis, was finalised with the descision of the German Ministry of Defence to open contractual negotiations with the ARGE K130 for the building of 5 corvettes. The building contract was signed on 13 December 2001. The program originally envisaged the construction of fifteen ships, but the program was reduced to five units due to budgetary restrictions. The ARGE K130 brings together the shipyards Friedrich Lürssen Werft (FLW) and Thyssen Nordseewerke (TNSW), under the overall control of Blohm + Voss (B+V). The construction program is divided among three manufacturers sites, the front part of the hull is built in Nordsweerke in Emden, the rear superstructure at Blohm & Voss and Lürssen. The design concept of the ARGE K130 is based on the development of B+V's MEKO® Class A frigates and corvettes - a concept that had attracted significant interest on the international market - and on the latest FLW design concepts for export orders. In important fields of technology, the developments that were begun for the Class 124 frigates, have been consistently followed through, for example in the area of on-board automation, in the computer and network technology and in the software for weapons and guidance systems. In addition, the K130 incorporates numerous new developments and innovative proposals. As an example, a standard of accommodation and comfort hitherto unattained in naval vessels has been achieved. The accommodation is designed to take both male and female crews. The Corvettes are specially thought for littorial warfare in areas far away from bases, which is evident in their internal comfort: 4 man cabins with a toilet and shower in each, air conditioning and other things sofar unheard of on a german warship. The K130 was to be the first naval ship in the world to be fitted with 2 drones for area reconnaissance and monitoring beyond the radar horizon. The corvette project was jeopardized by the cancelling of the Polyphem missile (its primary land-attack and anti-boat weapon) and the Seamos drone (its primary surveilance system). To replace those systems, it is envisioned to give RAM a secondary anti-boat role, while the RBS-15 Mk 3 will most likely have a secondary land attack role. For the surveilance drone helicopter, a foreign model might be acquired, but a Sea Lynx with Sea Skua missiles could just as well be used. These ships are the first to be equipped with the new MASS decoy system. As far as the radar and infrared signature is concerned, the K130 has stealth properties. This permits deployment in coastal waters in particular within the remit of multinational rapid response forces. German corvettes tend to vent at the sides of the ship, mostly because the area behind the engines is used otherwise. In the K130, it was "discovered" that the exhaust damaged the paint, so the corrosion-protection black paint was eventually drawn higher behind the exhaust ports. The exhaust is cooled with seawater to a manageable level (which of course is primarily done for signature reduction), also automatically making the gasses denser so they stay at the water line. These ships are the first squadron of corvettes with the versatile mothership Donau, unit based in Warnemünde on the Baltic near Rostock. Officials initially planned to induct the vessels by 2008, to supplement the Gepard-class fast attack craft operated by the Navy. Although two vessels were inducted in to the naval fleet in 2008, it was later found out that the gearbox was defective. During sea trials with the fourth unit, F 263 Oldenburg, some of the gearbox’s screws loosened and fell into the gears causing significant damage. In May 2009 the Braunschweig class corvettes were temporarily decommissioned, as some of the components need to be refitted. The ships had been scheduled to enter service in early 2010, and according to the Navy, at least one corvette would be ready for service in the course of 2010. But as of 2012 it appeared to some that the vessels were unlikely to enter active service before 2014. Originally the “Braunschweig” class was to be commissioned between May 2007 and February 2009. Designated to replace the ageing Tiger and Albatros class fast attack craft of the German Navy, the delay in the induction of the vessels may result in the reduction of the operational capabilities of the naval forces. The propulsion had to be upgraded, and the flawed transmissions and air conditioners were repaired. For a long time the K 130 corvettes were noticed mainly due to delivery delays. That's over. In 2013 five units would be ready for use. In December 2012 Magdeburg successfully passed their baptism of fire came in the UNIFIL mission, and Braunschweig would operate starting in April 2013 in the coastal waters of Lebanon. The Corvette "Magdeburg" in the UNIFIL mission covered around 16,000 miles in three months off the Lebanese coast. The third ship, the "Oldenburg" followed into service on January 21, 2013. The remaining two sister corvettes "Erfurt" and "Ludwigshafen am Rhein" completed the 1st Corvette Squadron in mid-March 2013. However a few months passed until the final operational capability of the ships. "These three units will achieve the status of 'ready for use' by early 2014. Before this, demanding usage training and contract-related warranty time shipyard must be traversed", Commander Stefan Schulz (41), S3 Executive Officer of the 1st Corvette squadron in Rostock, said in January 2013. Other reports [ie, IISS 2014] claimed that as of 2013 three units remained out of comission due to propulsion problems. These later three units were all commissioned in early 2013, some five years after initial delivery. As of 2017 the country's navy has a total of five K 130 Braunschweig-class corvettes. 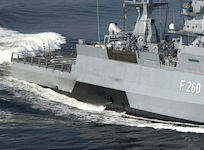 At least five Braunschweig class corvettes would enter service with the German navy in the next few years, in what can be seen as a signal to Russia, according to the newspaper Suddeutsche Zeitung. The German Bundestag (parliament) approved a purchase by the country's ruling coalition of a further five Braunschweig class corvettes worth a total of 1.5 billion euros. Germany's ruling coalition includes representatives of the center-right Cristian Democratic Union party (CDU), the conservative Christian Social Union party (CSU) and the Social Democratic Party (SPD). "To cope with the new security challenges in the Baltic region, the Mediterranean and in the world as a whole, the coalition of the CDU/CSU alliance and the SPD plans to purchase five new corvettes for the German navy worth 1.5 billion euros," the Suddeutsche Zeitung quoted the sources as saying. The first two ships were expected to be put into service in 2019, while the other three vessels are due to become part of the German navy by 2023. The decision to purchase five more Braunschweig corvettes for the German Navy was unexpected, as it was not envisaged by previous plans for the development of the German Armed Forces. The plan for the construction of five additional corvettes was only made public on October 14, 2016. Formally, the construction of five more corvettes was motivated by additional requests from NATO, handed over to the German Defense Ministry in July 2016, for the provision of two additional corvettes at the disposal of the combined forces of the bloc from Germany for the permanent readiness forces beginning in 2018. Accordingly, in order to have two additional corvettes in the permanent readiness forces, it is necessary to have in the fleet in total additionally not less than five such ships (taking into account the ships engaged in combat training, maintenance or repair). However, it is obvious that the main reason for purchasing the additional five corvettes is Germany's desire to build up its armed forces in the light of NATO's tense relations with Russia. Initially in 1995, the German Navy planned the construction of 15 corvettes for the K130 project to replace its fleet of large missile boats of projects 143A / B. However, as a result, for financial reasons and because of the dissatisfaction of the German fleet, a number of characteristics of the K130 project in 2001 were ordered only five corvettes. The construction and testing of ships were accompanied by numerous technical problems, and the actual commissioning of these five ships, such as Braunschweig, laid in 2004-2006, stretched to 2013-2014.